The Cold Recycling process involves the mixing through of appropriate binding agents (bitumen emulsions) to form a new rejuvenated road base. At Callington we have developed a mobile road recycling processing plant which produces a rehabilitated road base of the highest quality and consistency compared to conventional recycling processes. The specially adopted and tailored road recycling equipment will provide the maximum efficiency and durability from the existing pavement. 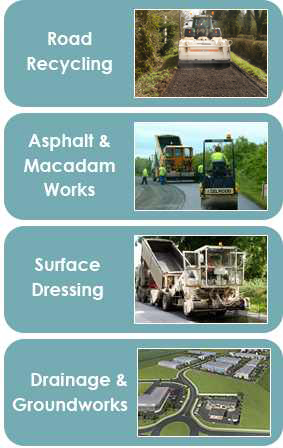 All recycled material are crushed and mixed to predetermined and tailored emulsions quantities with additional aggregates if required to achieve the optimum results from the existing pavement material. 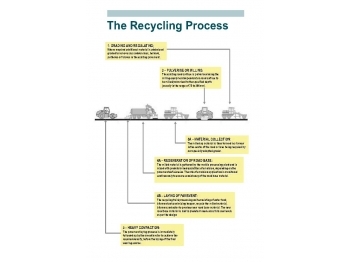 All materials entering the process are monitored, recorded and controlled by an automated system throughout the recycling process. • Grading and regulating of the existing road surface with cl804 is carried out to remove any sudden rises, hollows, potholes of failures in the existing pavement. This process is carried out by highly competent, experianced operators using modern grading machines. • Pulverising or milling of the existing road surface is then carried out using a Wirtgen crusher to produce appropriately graded aggregate to a predetermined depth into the existing pavement. • The pulverised or milled existing road surface is collected into a furrow in the centre of road or carriageway using a specially modified grader. •The furrows of milled material is gathered by the mobile processing plant consisting of water tank, bitumen tank and mixing hopper which mixes predetermined volumes of emulsion and aggregates together to produce the optimum road base from the existing road surface. • The new road base material is laid to predetermine cross falls and levels as per the design. • The road base is immediately followed up by the smooth roller to achieve the required density before laying of the final wearing course.